"We’ve actually increased our total spending on public education in the last 30 years by 100 percent in real dollars, and what we noticed is that there’s some but very little correlation between high performance and more money,” said Allen Grossman, a senior fellow and retired M.B.A. Class of 1957 Professor of Management Practice at HBS, who led the project’s education research. As the dark clouds over the nation’s economic future appear to be lifting, critics say the United States still needs to address a number of deeply rooted challenges to remain a leading business force on the world stage. Among the most stubborn perceived roadblocks to sustained prosperity are the country’s deteriorating transportation infrastructure, a shortfall of workers with crucial 21st-century skills, and an underperforming K-12 public education system, according to recent research from Harvard Business School (HBS). Nearly 2,000 (1,947) HBS alumni surveyed for the “U.S. Competitiveness Project” labeled the nation’s K-12 public education system the weakest of 17 components deemed vital to the country’s long-term competitiveness, such as entrepreneurship, capital markets, and the tax code. The project, co-authored by Michael E. Porter, the Bishop William Lawrence University Professor, and Jan Rivkin, the Bruce V. Rauner Professor of Business Administration, and published in September, is an expansive, yearly effort by HBS to identify and evaluate the ways the business community engages in key arenas that may contribute to — or undermine — the interests of American businesses and citizens. The country’s K-12 education system lags globally as students fall further behind in literacy and numeracy rates. While the nation ranks fifth in per-pupil secondary school spending, American students rank an estimated 17th in reading, 27th in math, and 20th in science achievement, compared with peer nations in the Organization for Economic Cooperation and Development (OECD) such as Japan, Canada, and Finland, the research says. “No one has to be convinced this is a critical problem, but there’s a lack of urgency in this country,” said Allen Grossman, a senior fellow and retired M.B.A. Class of 1957 Professor of Management Practice at HBS who led the project’s education research. Grossman launched a joint venture between HBS and the Harvard Graduate School of Education (HGSE) called the Public Education Leadership Project (PELP) in 2000 that helped inform this new research. He said this is the first time that the effectiveness of business/K-12 education partnerships has been formally studied. Grossman hopes the report will form a baseline for future analyses that HBS and other research outlets can build upon. 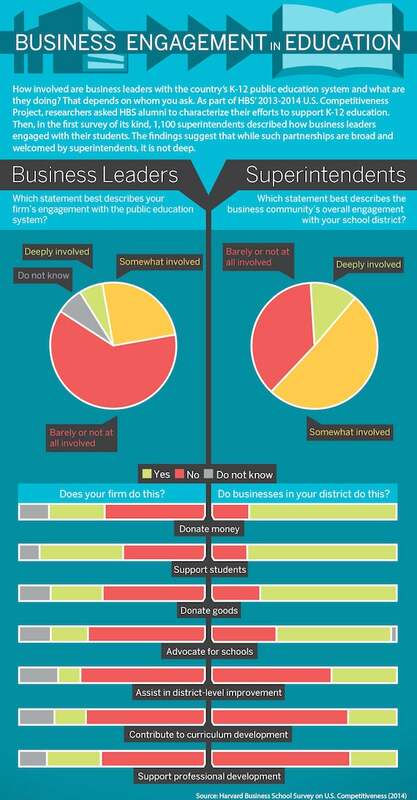 While the 1,100 school superintendents polled said they liked the idea of the business community being involved in K-12 education, very few had ever measured whether such partnerships were successful. In most cases, they were not. Superintendents were frustrated by some of the approaches, noting that business leaders were often misinformed or under-informed about the actual complexity and scope of challenges facing K-12 education. HBS alumni and superintendents held starkly different views of what the challenges are and how optimistic the nation should be about where K-12 education is headed, with businesspeople expressing far greater pessimism than superintendents. “The findings suggest that there is great untapped potential in the alliance between educators and business leaders. But tapping that potential will require a concerted and coordinated effort, especially to build a mutual understanding and trust between the two sectors,” the report concludes. Because business leaders often have enormous resources and significant political capital, they can and should play a leading role in helping reform K-12 public education, the study suggested, identifying three areas where business can be particularly useful and effective. First, business can be a credible public advocate for the urgency of education reform. Second, it can use its “franchising” talents to help educators scale up effective programs across districts, states, or even the country. “That’s how you grow your business, but school districts don’t usually have the skill set,” said Grossman. Businesspeople can also help by offering strategy and expertise to educators in areas like marketing and communications, data analytics, and leadership and motivation. While not every facet of business transfers to the education sector, many of the core concepts are valid and applicable. Monica Higgins, M.A.’95, Ph.D. ’95, the Kathleen McCartney Professor in Education Leadership at HGSE, agrees, adding that businesspeople need to better understand the unique confines under which K-12 educators operate. “It’s a much more complicated sector than perhaps meets the eye,” she said. Another difference that makes partnerships more difficult is “leadership in education is about exercising influence without formal authority all the time. In K-12, because you have so many local stakeholders and constituencies: parents, school boards, site councils, local politics, etc.,” it’s much harder to reorganize because education leaders don’t have the power to implement sweeping changes on their own, said Higgins. Even when educators identify beneficial reforms or programs, it’s difficult to implement them in other districts or to get them to work as well under different conditions. “Education is a local market business. You have different laws and regulations, different processes for hiring and firing principals. It’s very locally driven,” she said. “With those three differences, I don’t mean to say that business shouldn’t be involved, I just say it’s an opportunity for us to be much more thoughtful about how we collaborate, and I think that level of understanding, or lack thereof, came out in the report,” said Higgins. Despite such barriers, Grossman said that significant student progress in cities like Seattle, Salt Lake City, and Buffalo, N.Y., where business and K-12 educators are working closely, gives him reason to believe that meaningful change nationally is possible. “Almost everyone will nod when you say multitasking is inefficient, but no one will realize that serial tasking is just as bad. If you do Task A and switch to Task B, there’s a latency period where you find it very hard to switch,” said Sendhil Mullainathan, a professor of economics at Harvard. He is co-author, with Eldar Shafir, of “Scarcity: The New Science of Having Less and How It Defines Our Lives."